The Young Man writes. Or, at least, he wants to. In order to get inspiration for his work, he takes to following strangers down the street. Sometimes to restaurants, sometimes home, sometimes to work. He never follows them in. His rules won't allow it. But, what happens when his rules are broken? 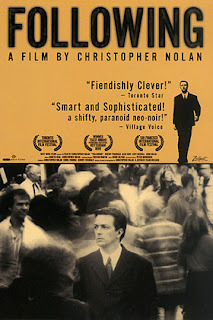 Following is Christopher Nolan's first film and has one heck of a story behind it. Shooting took place mainly on Saturdays in fifteen minute spurts for about a year and a half. The cast is composed of Nolan's friends and the script was based on an original idea he had in film school. This is the epitome of shoestring budget, but it is probably more intricate and impressive than 90 percent of what Hollywood is putting out today. Thematically speaking, Following sets-up the rest of Nolan's career. The dialog plays heavily into the tone of the film and the characters are incredible foils to one another. Light and dark are hinted out through the film. It's shot in black and white, pianos, The Young Man's obsession with black and white movies. The two main characters represent chaos and order and what happens when chaos disrupts order. The outcome is NOT pretty. However, different as the characters are, they are also eerily similar. Two sides of the same coin. Both are searching for meaning and trying to figure out what makes people tick. A look into what goes on behind the curtain. Like a good portion of Christopher Nolan's films, Following's timeline is disjointed and out of control. The film jumps from end to beginning and meets sort of somewhere in the middle and then spirals back out again to a big reveal that makes all the pieces fit together perfectly. For this being his first film, Nolan constructs a screenplay years beyond many of those working in the industry today. Paranoia and moral ambiguity play major roles in the film, and the claustrophobic camera work deftly places you into the scary headspace of The Young Man as his descent into the underworld of London's burglars becomes increasingly more risky until the time he realizes he needs out and goes to the police only to find out he's been set-up the whole time. Overall, Following outlines the career Nolan has been coloring in with films like Memento and The Prestige and I hope to see from him for many, many years to come. As far as a first time outing goes, the film is a step and a half ahead of any other director and most of its viewers for its entire runtime.